Photo by Melissa Salvatore for Splash/Sun-Times, taken yesterday. 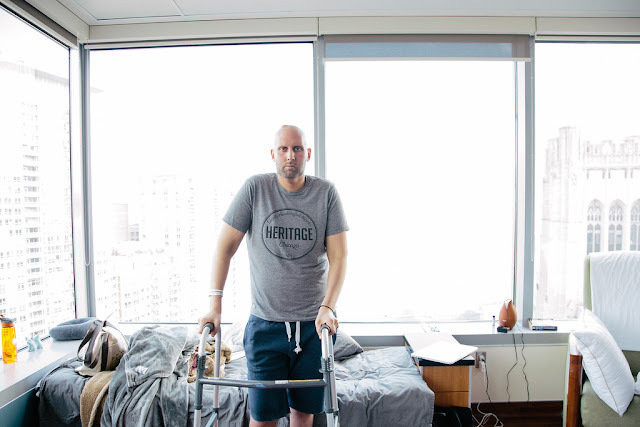 We've been following Jay Michael's series in the Sun-Times documenting his fight against Stage IV Non-Hodgkin Lymphoma. In Part V, which just came out today, Jay tells of the roller coaster of cancer, and how he went from being in remission to having a severe relapse and "small brain surgery" within a matter of days. Joy is very hard to come by and when I find it I hold it tight, especially these days. What was even more valuable was that this little spark of joy reminded me why I was here in the first place. God gave me a very robust challenge but things had gotten so hard for me I’d lost sight of the fact that I wanted nothing more than to live and for a few moments I forgot about how much I truly had to live for. So the fight will continue. Our thoughts and prayers are with you, always!